I’ve recently returned from my second stint in Fiji working with Operation Wallacea (OpWall), which is aiming to establish the first large National Park in Fiji. OpWall (www.opwall.com) is an environmental research and conservation expedition organisation, who design and implement biodiversity surveys undertaken by volunteers. 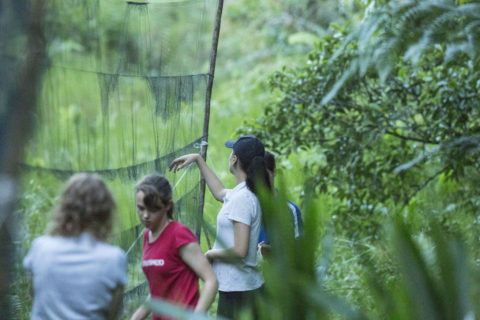 It is funded by tuition fees to run a series of biological and conservation management research programmes operating in remote locations across the world. In 2016, Nambu Conservation Trust (NCT) approached Operation Wallacea to help develop a National Park in Natewa province. In 2017, I spent eight weeks working with seven other scientists to carry out the first baseline flora and fauna surveys on the Peninsula. The NCT wanted their land on the steep slopes and plateau of the Natewa province and the adjacent Natewa Bay to be developed as a National Park to encourage visitors and homestays in the local communities. 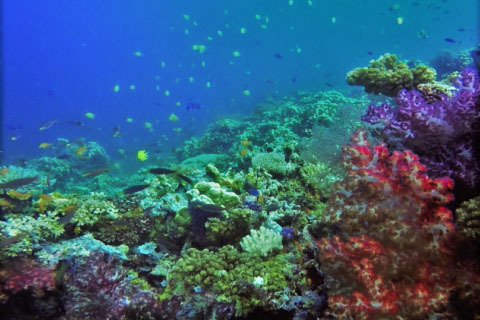 If a National Park were to be created anywhere in Fiji then the forests and reefs of the Natewa Peninsular would be one of the priorities, being identified as a Site of National Significance in the National Biodiversity Action Plan (Olson et al. 2009). 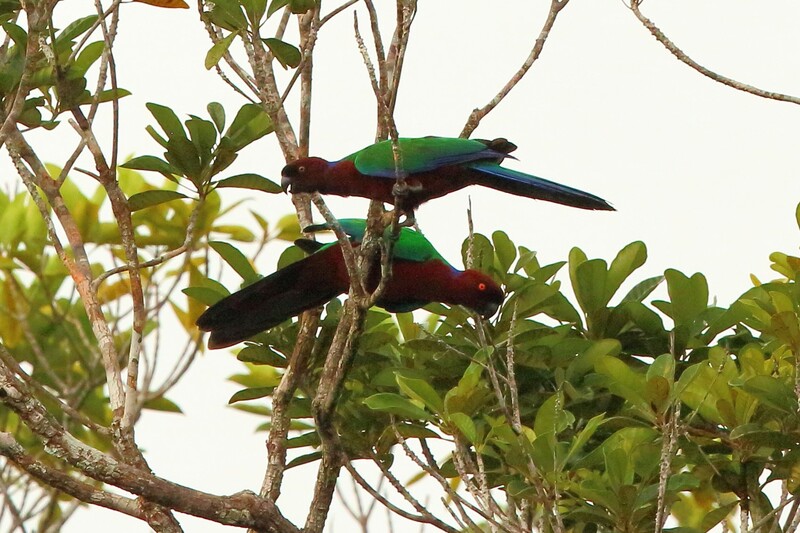 The forests had already been identified by BirdLife International as an Important Bird Area (Natewa / Tunuloa IBA http://datazone.birdlife.org/site/factsheet/natewa-tunuloa-peninsula-iba-fiji) retaining many of the Fiji endemic or threatened species that have disappeared on other islands. To be successful several mataqali (pronounced “matangalee”, which are family groups usually within a village that own or have traditional management rights to land) working together were needed to establish an area large enough for effective conservation. The key was to ensure that the local community gain financial benefits from the research, are trained in a range of areas including hosting and ecotourism skills and as a result encourage other mataqali to want to join in with the proposal. The concept of ‘research tourism’ such as that operated by Operation Wallacea was new to the Peninsula, so a deal of effort is being put into developing safety systems, operational procedures and training of key Fijian staff in how to support field research teams and provide a memorable experience for the participating students. My role was to undertake the herpetofauna surveys and oversee the bird monitoring. Eight weeks of intensive trapping and searching for reptiles and amphibians proved the presence of a simple terrestrial fauna in extremely low abundance. Life was very simple. We stayed in tented camps in the forest. With the local community providing guides and cooks to support the project. The transects were in rough mountainous country and we typically walked 15-20 km a day in the daily cycle of opening and checking traps. and the Natewa silktail Lamprolia klinesmithi (IUCN Vulnerable C2a(ii)) which is showing ongoing decline and endemic to the Natewa Peninsula. In 2018, a population of the shy ground dove Alopecoenas stairi (IUCN Vulnerable C2a(i)) was found in the area. While the herpetofauna is diverse it was in very low abundance, apparently due to mongoose predation. Two species previously not recorded on Vanua Levu, the Pacific blue-tailed skink Emoia caeruleocauda and the montane tree skink Emoia campbelli were found in the forests. A small population of Fiji tree frogs Cornufer (Platymantis) vitiensis was found. 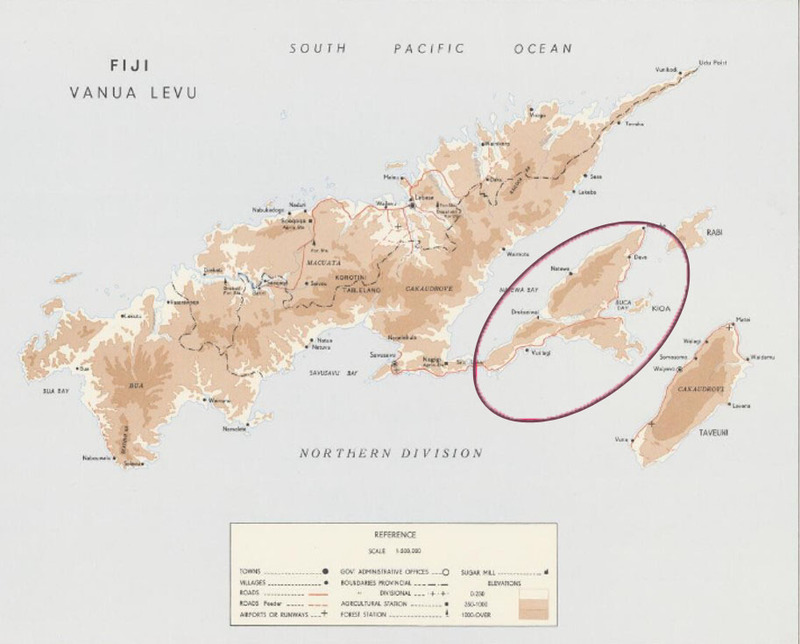 A single specimen of the Pacific boa Candoia bibroni and a population of Fiji ground frog Cornufer (Platymantis) vitianus (IUCN Endangered B1ab(v)) were found in 2018, suggesting persisting but very low populations. The Fiji ground frog was previously thought to be extinct on Vanua Levu. This increases the species distribution from five mongoose free island to six islands. The shell of a Vanua Levu land snail species not recorded since 1972 was observed and a new species of snail has been identified. A previously undescribed species of Swallowtail butterfly was identified and is presently being described. This species probably represents a new genus, and is likely endemic to the Natewa Peninsula. The rare Fijian stick insect Nisyrus spinulosus was recorded for the first time on Vanua Levu extending its know distribution to a third island in Fiji. An important outcome of the baseline monitoring in the first year was recognition that native ground-dwelling species were in very low abundance across the region and the small Indian mongoose was probably in high abundance and also distributed across the entire region. Given the distance of many of these sites from major roads and villages the later finding was contrary to previous research (Olson et al. 2006). Primary and secondary forest, away from villages, were seen to be a refuge from the small Indian mongoose for native ground-dwelling fauna species. Recent work, following the protocols of Olson et al. (2006), in primary and secondary forest in central Natewa Peninsula has found high levels of small Indian mongoose across the entire study area (D. Mellow, 18/07/18, Unpublished data). In Fiji, skink abundances on mongoose free islands have been shown to be approximately five times higher than when mongoose are present, irrespective of habitat type (Morley and Winder 2014). They conclude that it was very likely that mongoose severely supressed even commonly found skink species across all the habitat types. The Banded Iguana Brachylophus fasciatus, larger Fijian landsnails (e.g. Placosytlus spp., Aspastus spp. ), and both species of Fijian Platymantis frogs are among those vulnerable species that may have reduced probabilities of encounter and predation by the small Indian mongoose in remote forests (Olson et al. 2006). With all this in mind, I headed to Fiji again this year with the task of developing a program to reduce the impact of the small Indian mongoose on the Peninsula – which is the subject of Part 2 in this story. Effective mongoose control across Natewa Peninsula underpins local initiatives to recognise local biodiversity values, restore ecological integrity, protect threatened endemic species and develop ecotourism potential. This isolated impoverished area retains important natural values including extensive forest and unique threatened and endemic fauna. They seek to obtain economic benefit from developing Fiji’s first National Park. And with good reason, because the alternative involves clearing forest to enable planting of cash crops.